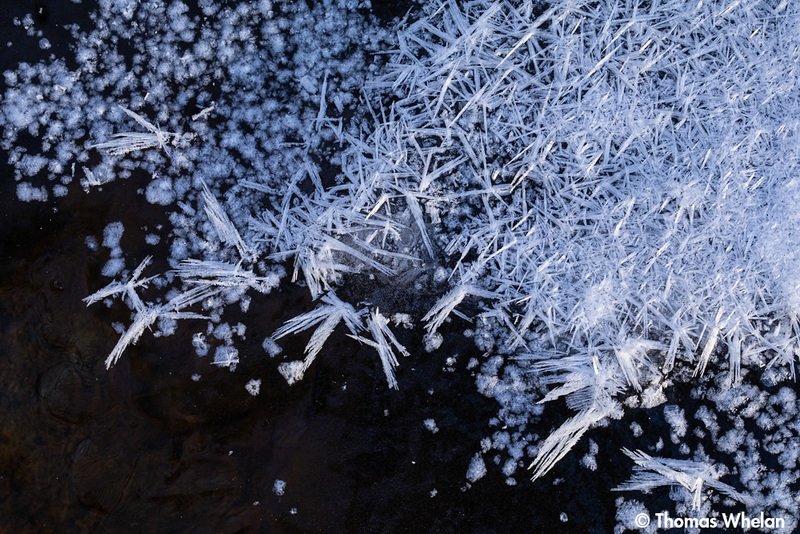 Do you know whether these ice crystals have the same internal structure as similar-looking mineral formations? The form that we see as snowflakes and ice crystals is in the hexagonal group, “ice Ih”. Some time ago I read a book by a Japanese physicist that said ice forms different crystalline shapes at different temperatures. I think most of what I see is hexagonal ice. The mineral your are thinking of may be hexagonal as well. According to the physicists who study ice, there a fourteen crystalline forms of ice (ice I, ice II, ..). One scientist counts eighteen and variants (http://www1.lsbu.ac.uk/water/ice_phases.html), but it seems that many of them form under unusual conditions. The crystal shape is determined by the different unit cell configurations of the water molecule, and these ice 1 to ice 18 forms fall under crystal family names familiar from crystallography (monoclinic, cubic, tetragonal…). Thanks. I didn’t realize so many crystalline ice forms exist. I assumed the elongated crystals are the ones you’ve called ‘stars,’ so I looked at some of your other posts and confirmed that. It’s odd — no matter how hard I try, I can’t see stars. Instead, they look like someone mowed the snow, and left the crystals lying around like grass clippings. It’s funny how we carry around a mental template for various shapes or objects (‘star’) and don’t realize it until something doesn’t fit our template. They certainly are beautiful. I got a grin out of this: “really chilly nights (less than 10 deg F).” Chilly? I should say so. As for Steve’s question, have you seen photos of the giant selenite crystals in Naica, Mexico? They do look remarkably like the ones you’ve shown here. “Naica, Mexico” is the link. You’re right, in this image, the crystals aren’t very star-shaped, but they form in the same way as other, more literally star-like crystals. The crystals in this image (https://tomwhelan.files.wordpress.com/2016/02/mg_3038-3-stars-750.jpg) are closer to literal stars. 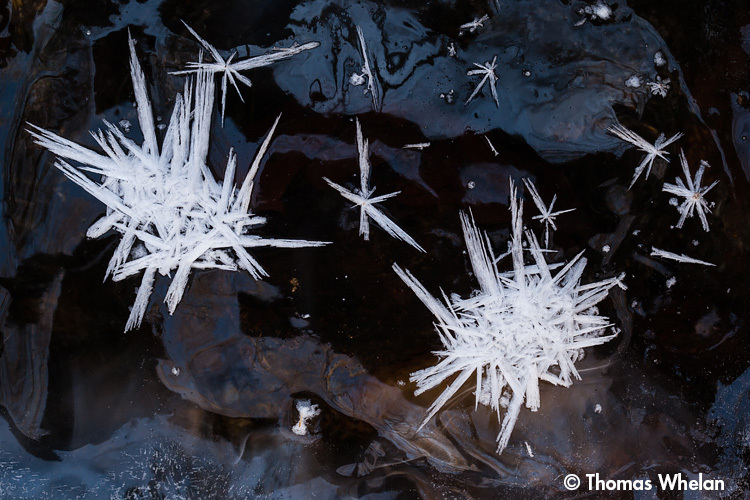 The crystals form as spikes that radiate from a center. Sometimes, as in this post, the radiating spikes overlap and form a mat of crystals. And they do look like selenium crystals – and selenium has a hexagonal crystalline form. I haven’t been out in cold enough temperatures to see stars so I will enjoy yours. It sounds like this weekend will be a great ice and frost event. Thanks, Steve! With several cold nights in a row, the conditions are promising. Yup. Cold isn’t so bad, it’s the wind chill that might do us in. I’ll have a thermos of hot chocolate in the car. I dress like a Michelin man on the really cold mornings – double gloves, three layers around my torso, snow pants if there’s snow on the ground. I can last for an hour or so, and the place I like to visit is fairly deep in the woods, cuts down on the wind.